WORLD Cup fever reaches its crescendo today (Thursday) as the first game, Brazil v Croatia, kicks off in spectacular style in Rio. West Belfast football fans who didn’t make the plane to Brazil can still soak up all the festival atmosphere as the Rock Bar embraces the carnival spirit throughout the historic tournament. 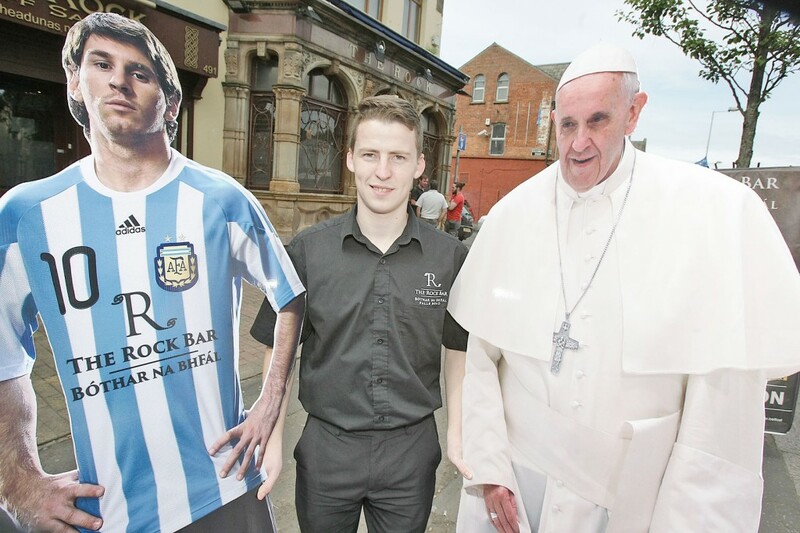 Rock Bar manager Christopher McAllister told the Andersonstown that staff were going all-out to ensure that customers have a fantastic World Cup experience. “We have live music before and after many games with massive drinks promotions during all Brazil, Argentina and ‘Anyone but England’ group games,” he laughed. “The bar has been decorated with flags and bunting so you can’t miss us from the road. “Our ‘Hand of God’ Argentina Supporters Club will be roaring Messi and co to victory and if you want to be part of supporting ‘Anyone but England’ then the Rock is the spot for you. “We also have World Cup-themed cocktails, shots and bombs. We will be serving ‘Pelé’s Paradise’ and ‘The Aguero Sombrero’ cocktails, and bombs such as the ‘Balotelli Bang Bang’, ‘Gazza’s Tears’ and the ‘Suarez Bite Bomb’. “A new air conditioning system has been installed to make sure all our customers stay cool when the South American temperature is soaring. “In a groundbreaking and historic move for the Rock Bar, we will be officially inviting the Queen of England to the bar to watch the England v Costa Rica game on Tuesday June 24 and we will even give her a pint of Guinness on the house – provided she gives us our six counties back. “The Rock Bar is recognised as the number one venue to watch live football in Belfast and we are going to make this World Cup one to remember,” he added. For those looking to whet their appetites before each game the Kennedy Centre’s 26 West bar and grill will have a selection of Brazilian cocktails and dishes on offer. Proprietor and Aberdeen winger Niall McGinn is travelling over this Saturday to take part in in the fantastic World Cup weekend they have planned. Asked who he fancied to lift the Jules Rimet trophy. Niall said he was going for the host country Brazil.